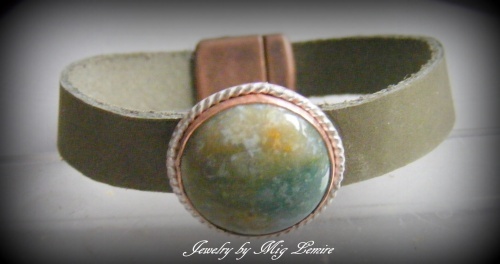 This leather mixed metal bracelet has a really pretty Jasper gemstone as the focal. Mixed metals of copper and sterling silver enhance the gemstone. Soft leather is an olive green color which matches the gemstone perfectly. Piece has a strong magnetic clasp. Fits average to a bit larger wrist.